The transmitter is a simple affair for which I claim no originality! It was put together from bits and pieces found in “W1FB's QRP Notebook” and the “ARRL Handbook”. The oscillator is a Colpitts type and runs continuously. It uses a 3.58MHz ceramic resonator to set the frequency. Series capacitor C12 can be varied to adjust the operating frequency. The oscillator power supply is provided by a 5V regulator to keep the frequency from drifting as the battery discharges. The 5V supply also powers the keyer logic. 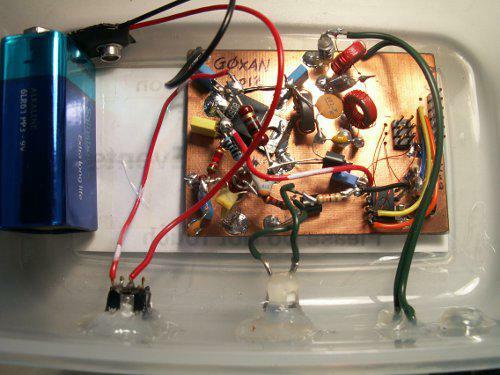 The power amplifier uses an N-channel MOSFET with a tuned drain circuit. The amplifier is keyed by a PNP transistor in the positive supply. An NPN transistor is used to interface the logic-level output from the keyer to the keying transistor. The R-C filter formed by R11 and C4 provides shaping of the keying waveform to prevent key clicks. The output filter is a 5th order L-C low pass filter designed from the tables published in the “ARRL Handbook”. Since the transmitter power is very low T37 size cores are sufficient for the coils. The keyer uses an Atmel ATTiny45 micro-controller to provide a programmable message keyer with fixed keying speed (12 wpm) and programmable message cycle times. Programming is via a USB serial port adapter such as the circuit described here; the keyer provides a simple text interface to a terminal program such as HyperTerminal, Realterm or similar. When the keyer is connected to a PC transistor Q1 detects the USB 5V supply and switches the keyer into programming mode. The keyer message can be up to 15 characters long. The message transmission time may be set to 15, 30, 45 or 60 seconds and the message will be sent continuously during that time. There are two other parameters to control the timing, the index number of the transmitter and the total number of transmitters in use. If several transmitters are set up, each with a different index number and the same cycle time and total number of transmitters they will transmit in sequence. If a transmitter is set up with index and total both set to 1 it will transmit continuously. The message and the parameters are stored in on-chip EEPROM so they are saved when the power is removed and even if the main application is modified. Note that since the micro-controller uses its internal R-C oscillator for timing the accuracy is not great and two transmitters are likely to run at slightly different speeds, meaning they can quite rapidly go out of phase and end up transmitting at the same time. It is possible to calibrate the R-C oscillators to improve the accuracy but this is not something I have tried. See Atmel application notes AVR053, AVR054 and AVR351 for details of oscillator calibration. The circuit was built “ugly style” on a piece of copper-clad board which acts as a ground plane. The micro-controller was stuck on the board “dead bug” style with more “ugly” wiring. The pin headers for connecting a programmer and serial adapter were fitted conventionally, soldered on the bottom side of the board and linked through to the top side. Crude pads were formed on the bottom side by simply cutting the copper with a craft knife. The board fits into a small plastic food container which provides a waterproof enclosure. An external on/off switch, keying LED and antenna connections are sealed with hot-melt glue. The transmitter will run for several hours on a PP3 9V battery. The keyer only responds to two commands; one to set the message, the other to set the timing. Any unrecognised command will cause the keyer to display the current message and timing parameters on the terminal. To set the message, send M<message> where is your message of 1 - 15 characters. A-Z 0-9 / = ? All other characters will be sent as a space. To set the timing, send T<time> ,<index>,<total> where <time> is 15, 30, 45 or 60 (seconds), <index> is a number between 1 and the total number of transmitters and <total> is the total number of transmitters (maximum = 9). The code for the ATTiny45 will be available soon.